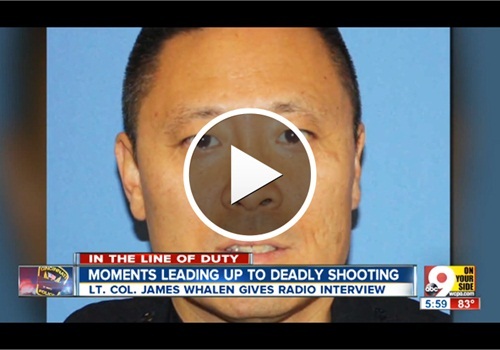 Earlier this week Cincinnati's assistant police chief detailed the moments leading up to the line-of-duty death of Officer Sonny Kim last week in Madisonville. Police said Kim's shooter, 21-year-old Trepierre Hummons, called 911 at 9:03 a.m. to report a black man in his early 20s "walking around, getting belligerent with a gun" at the corner of Whetsel Avenue and Roe Street in Madisonville. They said he called again a few minutes later, WCPO TV reports. Lt. Col. James Whalen told 700WLW Radio's Bill Cunningham that Kim, 48, was the second officer at the scene; a probation officer had arrived and talked to Hummons for a minute, Whalen said, but was waiting for a second officer before getting out of his vehicle. Because of Hummons' behavior, Whalen said, Kim had his Taser drawn. Hummons' mother, trying to diffuse the situation, stood between the two with her back to her son, Whalen said. It wasn't until she saw Kim discard his Taser and get his gun that she realized her own son was armed, too, Whalen said. Both men fired at each other, and Kim was mortally wounded. Another Cincinnati policeman, Tom Sandmann, arrived shortly after Kim was shot, "taking fire before he even got his car in park," Whalen said. Sandmann escaped, got around to the back of his car and was able to return fire, delivering the fatal shot that stopped Hummons, Whalen said.